GB Green Push Escape is another point & click escape game developed by GelBold. 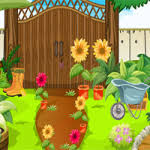 Assume that you are going to escape from a green push garden by using objects and hints to solve puzzles. We hope you will escape from this garden. Good luck and have fun! might have to stop at squiggly line puzzle..
Can't figure out bird color sequence.. Tried BF with no luck. Yes, also not sure about squiggle puzzle. Ah..for squiggle puzzle, use sawtoothed object in inventory first. Gives pattern..
Eesh, final puzzle even trickier.. Use two objects in inventory on first, then click crescent objects to get them to places they fit on object in center (color matters). Mirror-effect. Not a fan.